Cooking/baking mishap is a common phenomenon everyone cooking or baking in the kitchen must have encountered at least once (in my case pretty often) in their life. Sometimes out of unmindfulness we botch up a dish that we might have cooked umpteen times earlier by missing out on some key ingredients or blundering a crucial step. If while cooking, I enter a serious conversation with someone, chances of my forgetting something to add are ample with the final output turning awful in taste. Hence usually when I invite someone over to my place, I keep everything ready beforehand so as to avoid culinary disasters. I had a group of guests invited to our place yesterday over dinner. The invitees were all vegetarians, so the menu included an assortment of veg dishes, some of which won havoc appreciation from all. 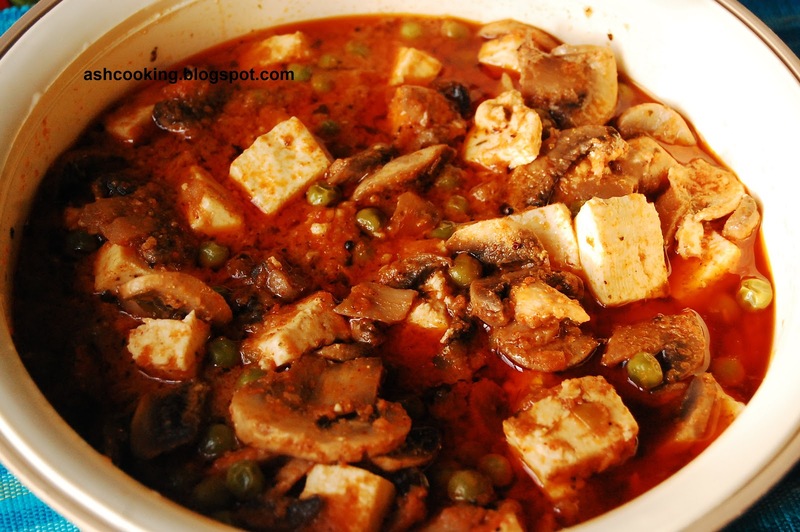 One of them is the Mushroom Paneer Butter Masala that I cooked being inspired by the recipe from http://madhurasrecipe.com/. I modified the sauté ingredients a bit, but that apart, everything remained same to what Madhura has described in her video. 1) Puree tomatoes and green chillies together. Keep aside. 2) Heat oil in a wok. When oil turns hot, add black mustard seeds and curry leaves and allow them to crackle. 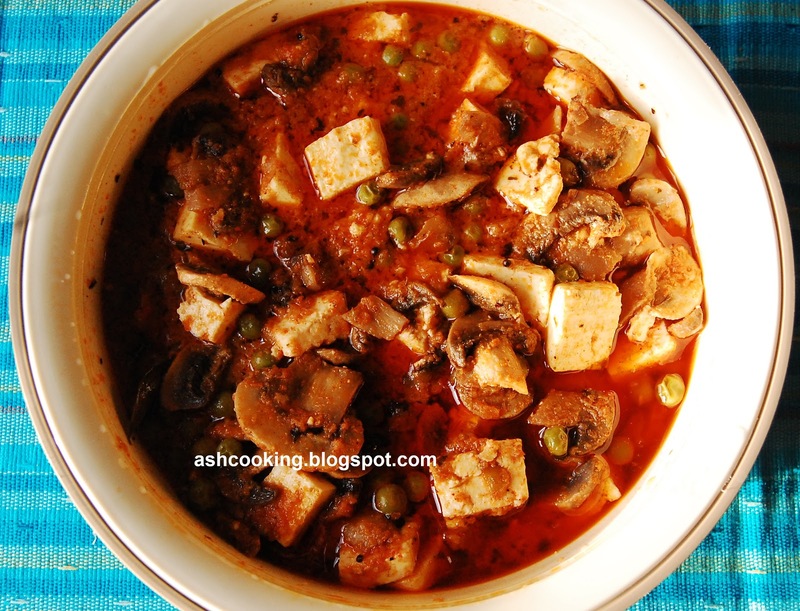 3) Add tomato-green chilli mixture and cook it for 5 minutes, stirring occasionally. 4) Add ginger-garlic paste, cumin powder, coriander powder and kashmiri red mirch. Cook for 2 minutes. 5) Toss in the butter and cook for 5 minutes. Add garam masala powder, dried kasuri methi, salt and 1/4 cup of water. Cook covered for 3 minutes. 6) Slide in the mushroom slices and frozen peas. Cook till mushroom is cooked through. Add paneer cubes and stir in. 7) Finally add whipping cream and simmer on medium heat for 1 minute. Turn off the heat. 8) Serve hot with roti, rice or paratha.